Redondo Graphic artist Omaha Perez to sign "Lost Angeles"
Los Angeles cover art by Tony Talbert. Graphic novelist Omaha Perez of Redondo Beach likes to go through the looking glass. In “Bodhisattva” he delved into Hindu cosmology, human and divine betrayal, and superhuman transformation. In “Holmes” he transformed a staid Victorian icon into a drug crazed helter-skelter. In “Super Terre.r” he explored space habitation and the illusory nature of utopia. 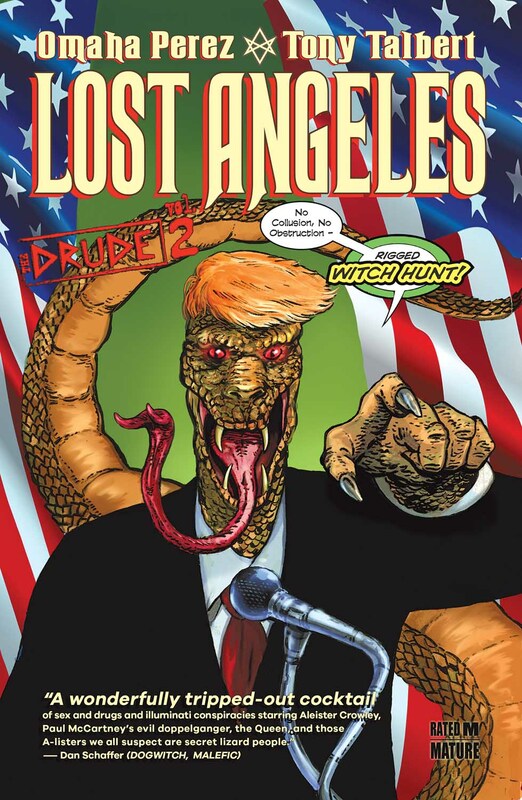 With his latest effort, “Lost Angeles,” Perez fills a Southern California nightmare-scape with conspiracies vast and goofy, from the Illuminati and its likely leader (Oprah), to lizard people (including Donald Trump), and Billy Shears, the bass player who has (maybe) doubled for Paul McCartney since his “death” in 1966. Romping bewildered through this over-the-top minefield of skullduggery, convulsive violence, and inhuman vice is Perez’ recurring protagonist, Boris Drude, a 40-ish rocker who just wants to enjoy a simple life of bar gigs and inebriation. But to his dismay, Drude has a second sight that appears to penetrate the lizard-ish veils behind which the evildoers hide. All the while Drude must deal with the existential question: Is all of the above really happening, or is it just an illusion? To further complicate matters, he finds himself entangled with a doppelganger Drude, who might or might not be the real him. 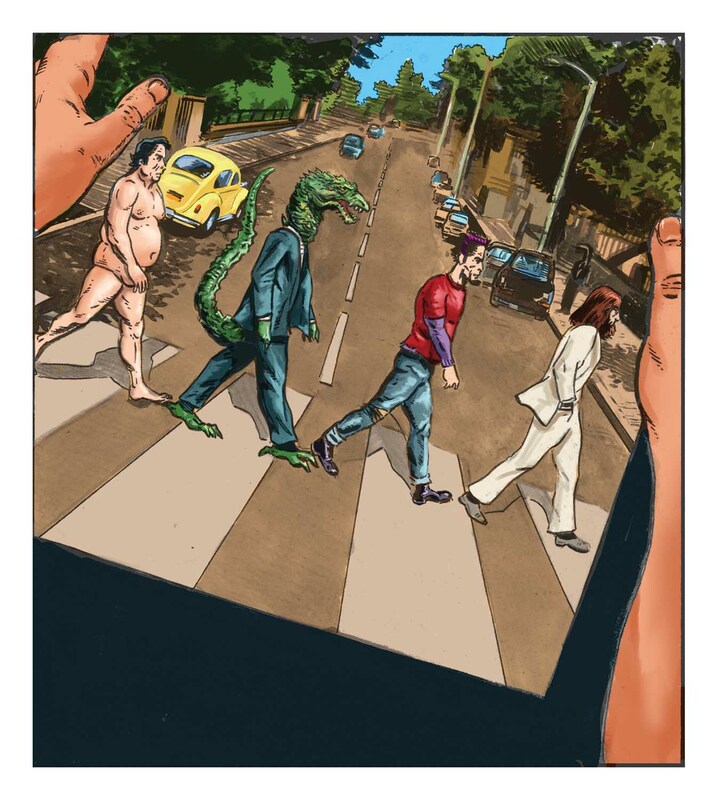 On the upside, Drude is aided along the way by the ghost of John Lennon. Sounds complicated, but Perez and artist Tony Talbert spool out the story in digestible surges, page by page, creating a satisfying read that is whimsical, orgiastic, funny and soaked with vice, as it goofs on the main question that occupies Perez’ creative vision: What is reality? (Parental advisory: If you give this book to your small children, you’re probably a bad parent. “The question [of what is real] is a recurring theme in my books. 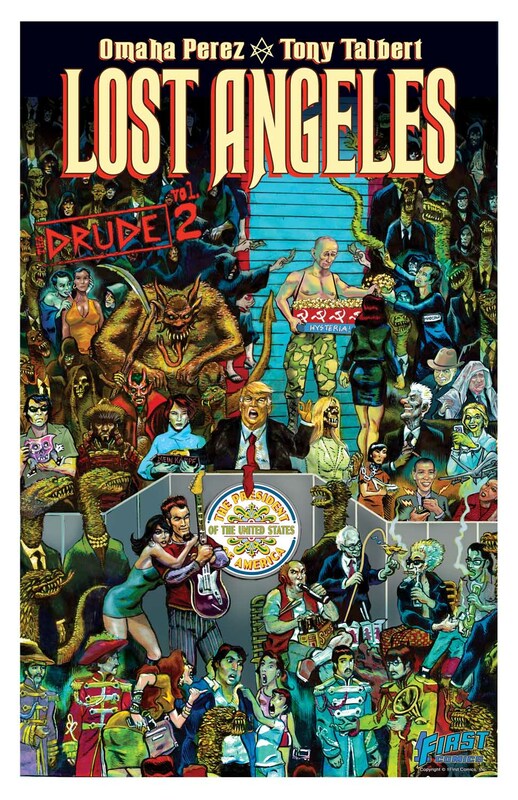 Not that the Drude books are very serious, but through all of them is the recurring theme of the nature of reality, the Hindu concept of maya, the idea that life is an illusion,” said Perez, who will sign copies of “Lost Angeles” April 17 at The Comic Bug in Manhattan Beach. Perez sees Boris Drude as a “Lebowski-esque character, a reluctant protagonist” who “just wants to get loaded and have a good time, but he sees things that may or may not exist in reality, and he gets drawn into some deeper, darker scenarios. Perez, 48, grew up in the San Francisco Bay area, and developed a taste for comic books early on. “My dad died when I was pretty young, but he had me into comics from the start. I had access to his underground comics” by the likes of pop culture icon Robert Crumb and Gilbert Shelton, father of the Fabulous Furry Freak Brothers. “I was also exposed to the old Marvel comics. I loved [comic art innovator] Jack Kirby before I knew who he was,” Perez said. Perez produced “a couple of little comic books” while he was in art school in the ‘90s. Then he moved to Southern California where he worked as a graphic artist and continued making comics, drawing stories that would be scripted by writers. In time Perez took over writing his comics as well as drawing them, resulting in a graphic novel catalogue that began with “Bodhisattva” in 2005. Twelve years ago, when Perez was drawing his first Boris Drude graphic novel, he noticed symptoms that would be diagnosed as Parkinson’s disease. “It didn’t really affect my drawing at first, but before I was halfway through the book it was pretty bad. Also I was in denial, I wasn’t up for any medication yet. I just suffered through it. It took longer than it should have to draw the book,” he said. “I drew one chapter left handed, and I don’t know whether it was good or bad that people didn’t know the difference,” he said with a laugh. He began collaborating on his graphic novels with other artists, including Talbert. His condition does not hamper his continued work in graphic design. It has forced him to do some work left handed, but that has not caused a drop-off in quality. Omaha Perez will sign “Lost Angeles” 5 to 8 p.m. Wednesday, April 17 at The Comic Bug, 1807 Manhattan Beach Blvd., Manhattan Beach. Also signing will be 1First Comics creators Yuan twins (“Love Town,” “Serving Supes”) and Dan Cote (“ZEN: Intergalactic Ninja”).